Rhinitis, which is sometimes called hay fever, is an inflammation of the nasal passages. Short episodes of rhinitis can usually be caused by respiratory tract infections with viruses, for instance, the common cold. Severe rhinitis, on the other hand, is caused by allergies, but it can also be brought about by medical conditions, the overdose of some drugs, or other factors. A lot of people are afflicted by allergic rhinitis for long periods of time – the condition is a life-long one for them, which just mounts and ebbs from time to time. It is a good thing that the symptoms of rhinitis can be managed via proper lifestyle changes, medications and immunotherapy. People can acquire allergic rhinitis at any age, but most of the time, people develop the disease in their childhood. The symptoms become worse when the person reaches his or her 30s or 40s. However, the gravity of the disease tends to vary throughout life. Patients may experience times when they have no symptoms at all. Allergic rhinitis is caused by a nasal reaction to small air particles called allergens, which also bring about reactions in the lungs (asthma) and eyes (allergic rhinitis). Allergic rhinitis can cause a bevy of irritating symptoms, such as sneezing, nasal congestion, runny nose, itching and postnasal drip. Allergic rhinitis is bad for the respiratory system. Since it causes so much sinus pressure, it tends to make breathing difficult for the person afflicted with allergic rhinitis. Allergic rhintis is bad for the immune system. It makes the body susceptible to the effects of allergens. 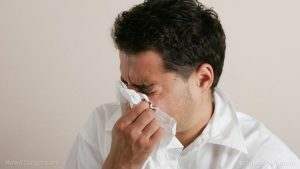 People who have a tendency to suffer from allergies caused by allergic rhinitis should avoid fruits such as bananas, melons and zucchini; vegetables such as celery and corn; additives such as benzaldehyde, FD&C Yellow Dye Number 5; herbs, nuts, and seeds such as almonds, hazelnuts, and sunflower; and extremely cold foods and beverages such as milkshakes, ice cream, iced drinks and iced slushies. Allergic rhinitis can be treated by reducing one’s exposure to allergens and other substances that can trigger the allergy. People afflicted with the disease should also try medication therapy such as saline sprays and nasal irrigation. Nasal lavage with warmed saline can be taken as needed, once a day, or twice, if symptoms are really severe. Saline nasal sprays and irrigation kits can be bought over-the-counter, or patients can make their own solution. People with a severe case of rhinitis should use a nasal decongestant for a few days before using a nasal glucocorticoid (steroids, sample brand names Flonase Sensimist, Flonase Allergy Relief, Rhinocort Allergy). Nasal steroids have mild side effects which include a sour smell and taste or drying of the nasal lining. Allergic rhinitis, which is sometimes called hay fever, is an inflammation of the nasal passages. Allergic rhinitis is bad for the respiratory and immune systems. Allergic rhinitis can be treated by reducing one’s exposure to allergens and other substances that can trigger the allergy.